Among my dad’s stuff, which I was going through several years ago after he died, I found this snippet. 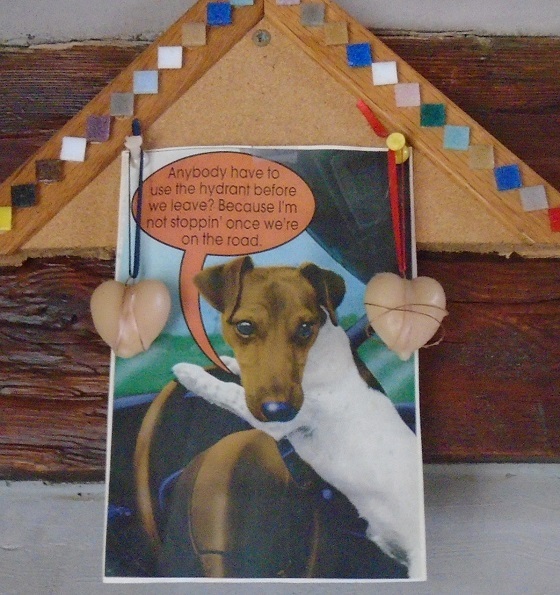 I pinned the snippet to a scrap of bulletin board, adorned it with my first-made beeswax ornaments, and hung it by the door of my home in Sand River. I put it by the door again when I moved out to Pelkie. The other day, when the movers had just about finished packing their truck, I wandered around my old empty cabin snapping photos of what remained, just so’s I’d know what was still there, and there it was. 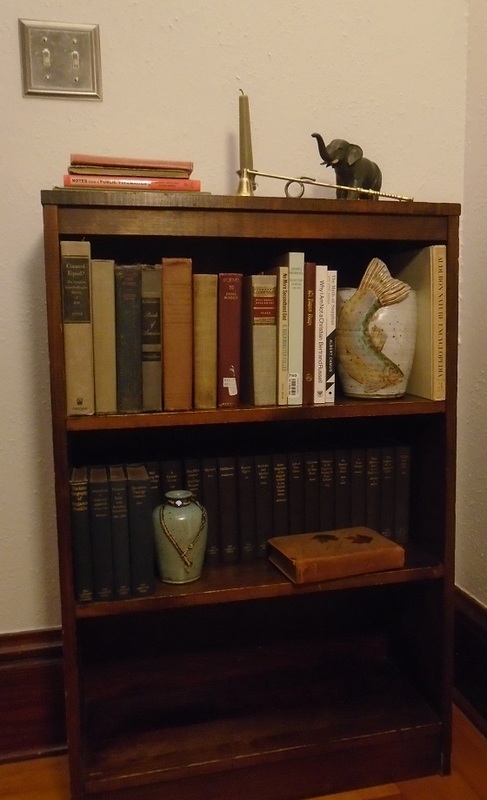 There are four small bookcases simply made, of wood with a dark stain, easy to move, exceedingly functional. Each is about 26 inches wide, two feet tall and a foot deep. They line up nicely side-by-side and can also be stacked. They have been in the family for years. My earliest memory of them is when they were side-by-side, stacked four-square, in the basement of the house I grew up in. The basement was small but finished with different rooms and areas. My dad had an office and a bathroom; the washer and dryer and a utility sink were tucked around a corner back by the furnace; there was a long narrow room with a workbench, a freezer, storage for stuff like paint and hammers and rags (and sometimes hamsters, gerbils and mice), and also in that room was a funny little door that led to a crawlspace. A short hall divided these rooms and areas—the hall ended at a door that led outside to where our garbage cans were kept—and it was in this hall that the bookcases held court, holding some old books, flotsam and jetsam, and old newspapers bound for recycling. It must have been when my parents moved to a co-op apartment, in the mid-1990s, that I inherited them. At the cabin, I lined up three at the edge of the loft to keep me from catapulting into the living room (though this did not stop Elliott), and now here, one night, I saw that they could go many places, they could go anywhere, they could go everywhere—indeed, they should be everywhere; there are not enough of them. I have always called them the “Artist Bookcases,” because I thought that was their name. But then I checked the sticker on the back of one. It says “Aristo-Bilt.” So I guess I was close. And I guess Mid-century is my style. I always thought it was just My Parents’ Old Stuff. Three of the four bookcases Formerly Known as Artist. I was pretty tired one night and kind of wondering why-o-why I had done this whole moving thing. I was missing the deer. I was watching the nightly news—my one free station! one more than before!—and California was in flames, again, and people were mourning the latest mass shooting, again (also in California), and I was willing my Aristo-Bilt Artist Bookcases to miraculously multiply so I could just finish arranging things, get things unpacked, when my sister called. From California. (Hey! My cell phone works here! A proverbial blessing! Or curse?) At some point she asked if I had a good book to read, something to sit down and relax with, to obliterate everything for a while, and I said no, I haven’t been to the library yet. But later, heading up to bed, I looked at a shelf of books I had unpacked and thought what a dope I am. I am surrounded by good books. This shelf held mostly books my father had, or that his father had had. They are in a bookcase which once was in my childhood bedroom. As far as I know, it is not an Aristo-Bilt bookcase, but I should check. My sister made the fish vase, my nephew made the other vase, I made the candle, and the elephant was Grandpappy’s. Give me solitude, give me Nature, give me again O Nature your primal sanities! Keep your woods, O Nature, and the quiet places by the woods. Give me faces and streets—give me these phantoms incessant and endless along the trottoirs! The next morning walking Josie, we saw people out shoveling those trottoirs. Later, when a neighbor took it upon theirself to snowblow the walk in front of our house, Josie had a good bark. 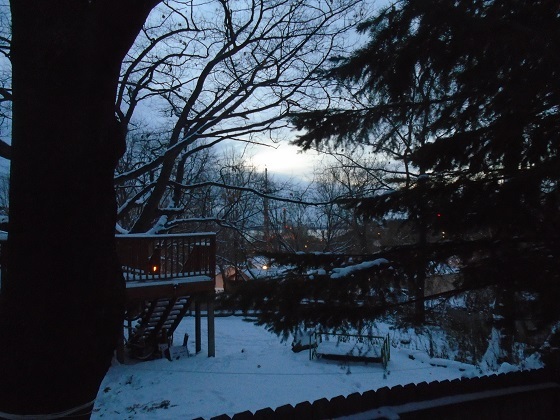 View from a deck, today, just before dawn.